Five years ago on this day was the first accidental collision of two satellites in Earth orbit. 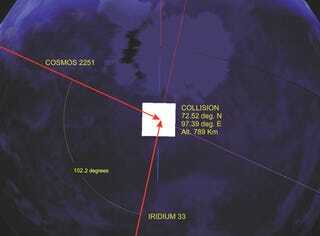 An out of service Russian satellite, Kosmos 2251, collided with a U.S. satellite, Iridium 33. Both satellites were destroyed and the collision produced a large amount of debris. The collision occurred at about 490 miles up, well above the International Space Station which was about 220 miles up but still heightened concerns about a future ablation cascade occurring. Someone should make a movie with that as a premise.